I'm crying the elliptical blues this morning. Ouch, ouch, ouch, oh, what's my penance: elliptical, why did I forsake you? We climbed to the overlook yesterday for Old Faithful. They say it's a half mile, but that's just to fool you into thinking it's a piece of cake. Let me tell you, it's more than a half mile and it was no piece of cake. Why didn't I wear hiking socks? I'm so lucky my husband brought mole skin. Little anklet socks don't cut it when you're hiking in Yellowstone. We did see a bison, though, and I didn't have to try to outrun it. 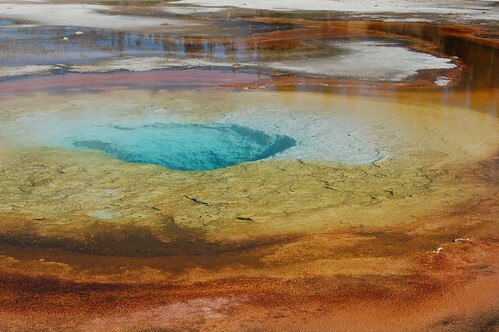 We oohed and aahed over many geysers and multi-colored thermal features, concentrating most of our hiking in the Upper Geyser Basin of Old Faithful. After you walk long enough, eyes peeled for wildlife, everything starts to look like an animal to you. That rock over there might look like an elk. A burned out fallen over tree might resemble a wolf. When I was looking through some of the photos I had shot, I spotted a bear. My heart started to pump. I called my husband,"Hey, come over here and look at this photo. In the lower left, there's a bear!! I soaked in the tub for a good half hour last night but every bone in my body aches. OK, I'm being melodramatic, only half of the bones in my body ache, the rest are asleep. We enjoyed another wonderful meal at Old Faithful. I'll say one thing about service at Yellowstone Resorts. Many of the people who work here are seniors. It's such a refreshing break from dealing with teenage mouth breathers. I think they should give seniors priority in any job, but that's probably because I'm heading that direction myself. 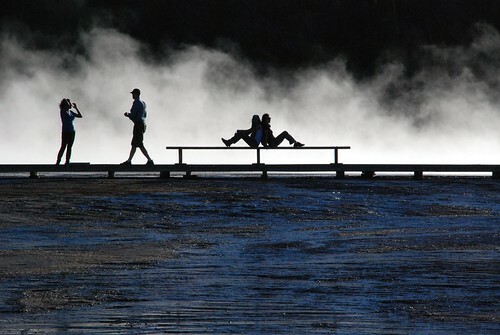 Although the younger workers in the Park are all very enthusiastic because many of them work 5 days and take the weekend to explore Yellowstone. 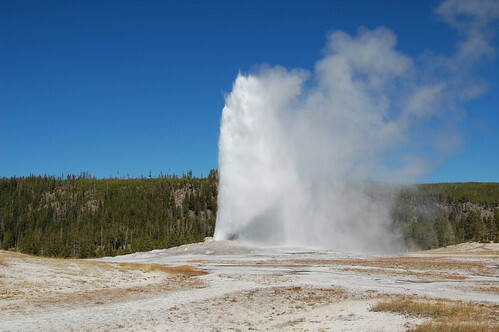 We had dinner at Old Faithful last night and I was so tired from hiking that when the waiter asked me how I liked it, I blurted out the truth. It was dreadful. The tenderloin was well done and I had ordered medium rare, plus they smothered it in steak sauce. The last time I had steak sauce on any piece of meat, I was 12. His face fell, so we tipped him well anyway. Bit of advice, don't order a steak medium rare at the Old Faithful Inn. 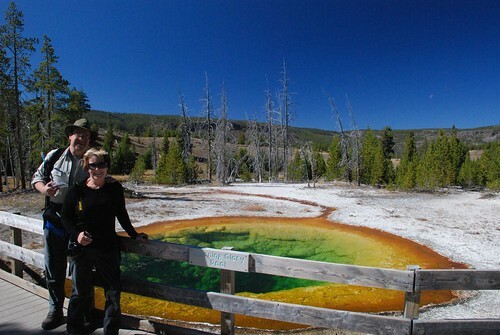 Here are photos of the Old Faithful and the Upper Geyster Basin. 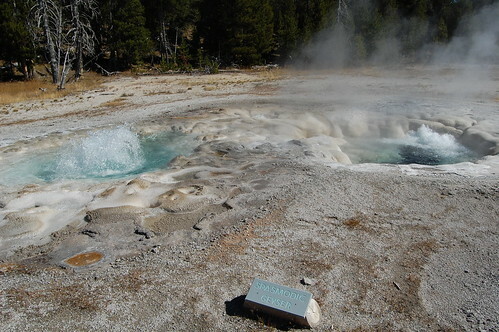 Some are geysers, some are pools. I especially liked the pool at the end. 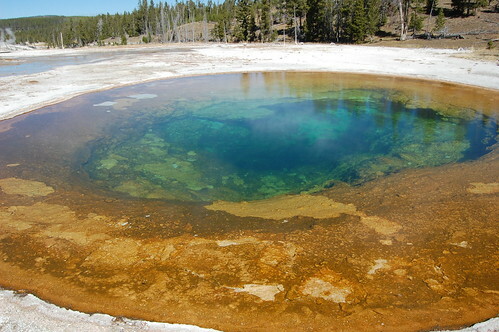 The multi-colored pools are, in order, Beauty, Chromatic and Morning Glory.